In 2016, Mr. Ramirez retired, completing 41 years in education, and 24 years as the principal of Indio High School. Mr. Ramirez is a graduate of UCLA. A former teacher, counselor, assistant principal, and principal, Mr. Ramirez is an advocate for students, parents, and the Indio community. Mr. Ramirez resides in Indio with his wife Elizabeth. Together they have five children. Four of his children graduated from Indio High School. Mr. Ramirez is a leader with a purpose and a passion for education. He is deeply connected to the Indio community and their families and is a true believer in academic success for all. Over the years, he has been recognized on numerous occasions for his dedication and the academic achievements of Indio High School. 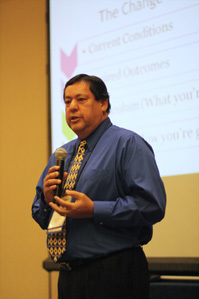 He has presented the Career Choices curriculum all over the country, and recently presented “Changing a Generation” to the Ohio Latino Education Summit.